Gun violence is well documented as a serious problem locally and internationally. On April 14, Avi Moyal, Chairman of the International Krav Maga Federation, (IKMF), of offering a workshop "Defending Against Gun Threats." 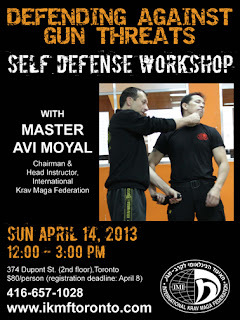 Avi Moyal was born in 1966 and has been learning Krav Maga since childhood. In 1985 he received his “Expert degree” and joined the IDF Marines, completed his Officers training with excellence, and served as a Platoon Commander in a Terror Demolition Unit. He acquired many combat hours and experience while commanding subordinates on special operations in Lebanon. He served as a Reserves PC in a special operations unit. Avi Moyal graduated his BA and a trainer’s course. He also graduated the senior trainer’s course in the Wingate Institute with excellence. He ran instructors courses in the Wingate institute for many years, and today he is one of the four leading Krav Maga authorities in the world (Expert level 6). Amongst his instructors were Imi Lichtenfeld RIP, Eli Avigzar RIP and Eyal Yanilov. He instructs women, children and adults in the Israeli private, commercial and governmental sectors. Limited space available. Registration deadline is April 13th.